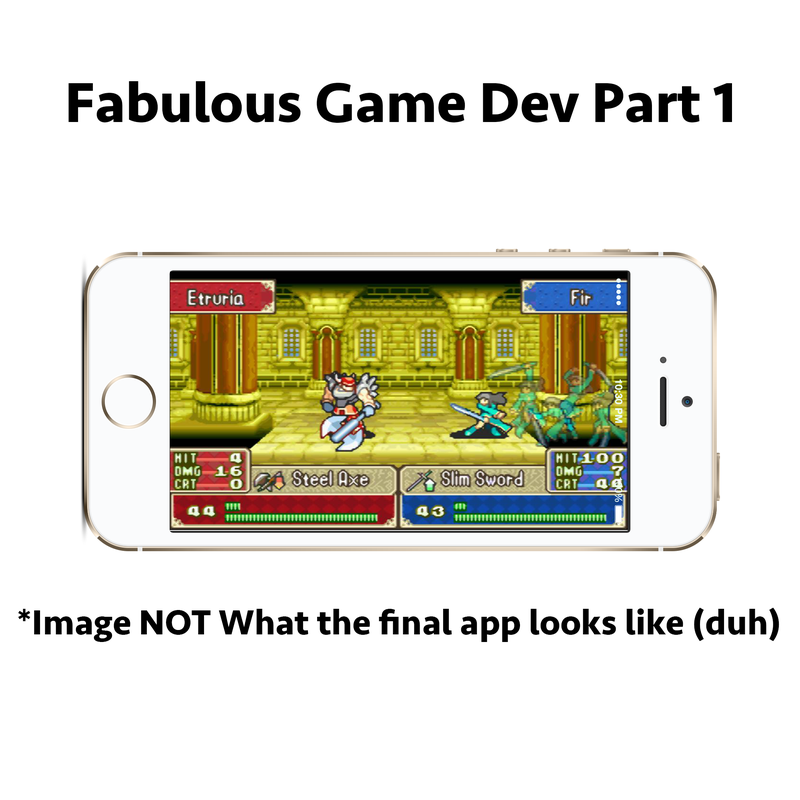 Fabulous Game Dev Blog 1! So, I don't know if you all knew, but I'm a computer science major in college. One of the courses I'm enrolled in is mobile application development and design. So, of course I've chosen to make a game! I figured it'd be pretty cool to talk about my exploits here on TAY. We're in the concept stage of design for our apps, and me and my partner for the project have decided on implementing something a little different. Here's the pitch: What if your phone had a feature similar to Nintendo's StreetPass? What kind of simple asynchronous game could you create with that? We've decided to go with a simplified version of a fire emblem fight (Swords beat axes, lances beat swords, axes beat lances). Here's how it would work: First you create your character, choose one of the three weapons, then choose a plus stat and a minus stat. Voila! you have your little character. Now when you pass by another person with the app installed the information on their character would be beamed to your phone. The app would then on the next time it is opened, trigger a fight between your character and theirs. There's no real interactivity here, it's just determining whether your character is stronger than theirs or not. It's a quick little animation to display the fight and then a results screen. If you win you gain xp. If you get enough xp you level up. The higher your level the easier it is to win. Simple, no? I'm not going to really go into the code or the technology that we're going to be using for the app just in case we decide to actually place it on the app store, but the phone to phone communication is the difficult part of developing the app. We have found a technology that can do it, but it's a fairly new one and the documentation on it is fairly slim. From there it's actually pretty simple to develop with a math equation handling who wins and who loses, and a separate animation based on the winner and loser. Since there are only three classes, there are only 12 animations in the app and a simple nested if-then statement can evaluate it. I've had some ideas to expand the app past that to involve some single player stuff (like training mini-games or fighting randomly generated cpu players), but I'm not going to worry about that until the initial concept is completed. I've started work on the mockups for the game, but as we've only finalized the concept today, they're not ready to be shown yet. I'm hoping that I'll have a group of mockups developed for the game by next Tuesday that I'll be ready to show off to everybody, but until then, I was wondering what you guys thought of the idea? Are you at all interested in hearing about our progress on the game? How interested would you be in picking up the app without the single player component? and at what price?